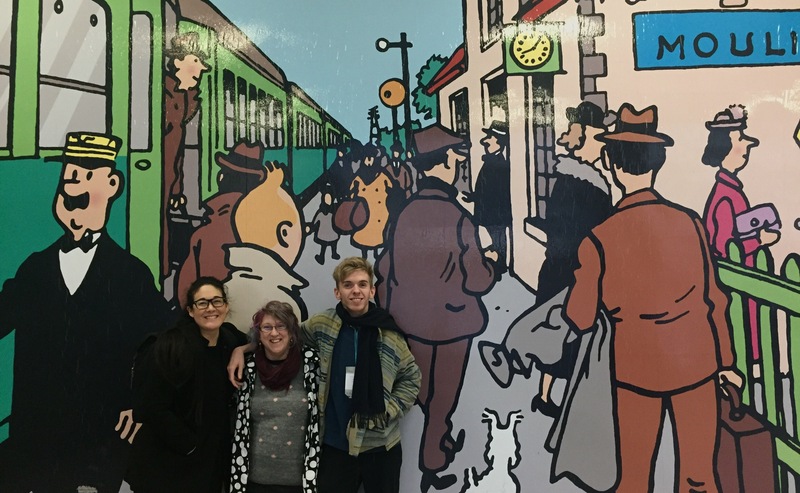 Unlimited’s Senior Producer Jo Verrent attended the IETM Brussels Plenary Meeting from 23 to 26 November, along with Sara Dziadik, Unlimited Programme Coordinator, and James Zatka-Haas, Unlimited Trainee. IETM is an international network of organisations and individual members working within contemporary performing arts. Twice a year it organises ‘meetings’ across Europe, as a gathering point to meet, discuss current issues, and exchange ideas for collaboration. IETM, or International Network for Contemporary Performing Arts, is an annual conference that invites over 500 performing arts organisations, individual members and cultural workers to think, talk and inevitably drink over the current issues the art world faces today. IETM is a biannual meeting, for both members and visitors- last year Unlimited Impact Trainee Emily Crow attended the November 2016 plenary meeting in Valencia (you can read her reflections here). With this most recent meeting held in Brussels, and given our credulous relationship with the EU and the fiasco surrounding the UK’s bid for European City of Culture, the setting felt all the more pertinent. Jo Verrent, Sara Dziadik, our pastoral care support Katie Fenwick, and I all jumped on an early Eurostar train bound for Brussels Midi. The majority of us were IETM newbies, so were eager to see what the conference and the city had to offer- though for me, I was curious to see what sort of contacts I would return to London with. We arrived at noon, and after rushing to drop off bags at our accommodation we, tired and hungry, crammed into a taxi to attend the newcomers’ event. Once there, we found that networking was obligatory (a skill that does not come naturally to me); after the heart palpitations mellowed and I remembered how to breathe again, I buckled up and candidly tried to explain Unlimited to various ears. What surprised me was the openness people had when approaching the topic of disability-led art. Sure, there were a few condescending remarks about ‘helping those in need’, but that only came through lack of knowledge and experience. On the whole, cultural workers around Europe were eager to find out who we are and what we do. Each year, IETM builds itself around a central theme, and this year’s theme was ‘Can we talk? Art in the age of populism’. The topic set itself against the position of culture within Brexit, the EU and Nationalist Politics, but looked for solutions rather than more problems. Over the course of four days, I encountered many different viewpoints; Julie Ward, an MEP for Labour in Europe, spoke enthusiastically about culture, maintaining that it should hold principal position in political debate for its ability to question established norms and generate new theory and ways of thinking socially. Steve Mayhew, an artist from Australia approached the topic of re-localisation as an opportunity for de-colonisation; fostering deeper connections with local people and art practices – in his case, native aborigine communities in his homeland. Along similar lines Ramesh Meyyappan, one of British Council’s IETM delegates, made a fascinating point about the need to ‘examine which stakeholders benefit when it comes to local work.’ Of course we need to voice local stories, but we also need to assess what these voices get out of the process. The talks I attended all felt like crisp antidotes to the current sluggish political rhetoric, championing art and cultural practices in their power to re-vamp the European Project and re-vitalise our civic life. Despite the theme, IETM doesn’t lose its sense of the informal. At its heart, the four day event feels like more a mass social gathering than a conference. Socialising is encouraged, especially amongst those who may otherwise not have crossed paths. The effect of this creates more than just business opportunities- you go away feeling as if the people you met are potential collaborators, mentors, teachers or, with any luck, friends. Brussels now seems the only possible setting for such an exciting and diverse IETM. This complex and inclusive city, with vibrant, intercultural and diverse communities was also the perfect setting for Unlimited… Jo and I were attending IETM with a mission- to deliver an “Access, Disability and the Arts” session on Friday 24th at La Raffinerie/Charleroi danse studio. On our arrival on Thursday, and later at the evening networking sessions, we met many new people- most asking if they could squeeze into Unlimited’s session! Running a workshop that would only work with a smaller number of people, we were already fully booked- but there was a buzz around the Plenary… people had heard about us, and more importantly- people were interested in access! The aim of our training session was to talk about what ‘access’ actually means – to demystify this term and look at how we could all provide access, and whose responsibility it is. The workshop was a full house and we, unfortunately, had to turn people away at the door! Jo started our session with a brief explanation of the work that Unlimited does, and then took the opportunity to show our developing animation, in its early stages, on the ‘Social Model of Disability’. The group were keen to explore ways to break down the barriers that prevent access to arts, and we dove straight into our workshop. Splitting into groups of 5 people, we looked at a range of situations and barriers, in order to find different ways to remove barriers and think about access creatively. The groups quickly understood the ‘Social Model’ and began to explore creative ways to provide access within the arts. One particular comment summed up my experience of IETM, of the attitude and motivations of the 900+ participants in this plenary: “Never underestimate your individual power and single application of effort- everyone has the power to make change.” I left IETM Brussels exhausted, but invigorated- to have met so many interesting and diverse artists and makers who are out to create, challenge- and change.